Paula’s latest Patreon entry was about Canada Day and horror westerns. Heather will be on hiatus for a bit. We’ll let you know when she comes back. I don’t currently have cable (though I do have reliable access to the show the next day), so I won’t be doing my live recaps until Friday at 8pm. My live recap and review for the season premiere are up. Season 13 titles so far: “Lost and Found” (13.01), synopsis and photos, promo, preview, sneak peeks, and Shaving People, Punting Things, as well as live recap and review; “The Rising Son” (13.02) synopsis and photos and promo; “Patience” (the first spinoff set-up episode) (13.03) synopsis; “The Big Empty” (13.04) synopsis; “Advanced Thanatology” (13.05); “Tombstone” (13.06); “War of the Worlds” (13.07); “The Scorpion and the Frog” (13.08); “The Bad Place” (13.09); Christmas Break; “Wayward Sisters” (13.10, backdoor pilot for the spinoff); “The Midnight Train” (13.11); “Various and Sundry Villains” (13.12); “Breakdown” (13.13); “Devil’s Bargain” (13.14); “Only the Best Intentions” (13.15); “ScoobyNatural” (13.16, cartoon episode, appears in March). Kittens! Kittens everywhere! 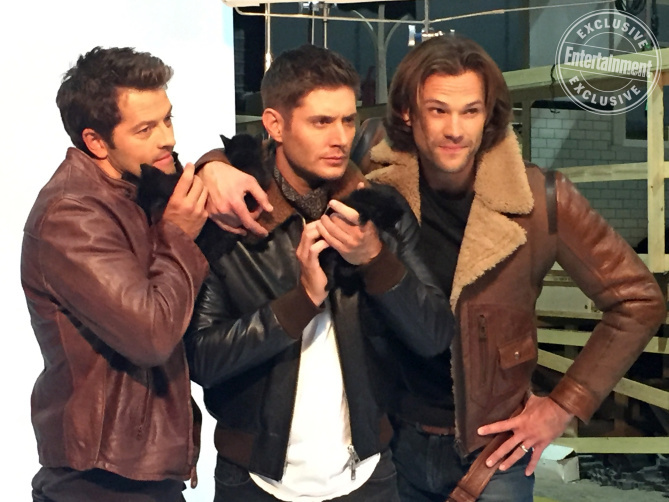 This/last week’s Entertainment Weekly celebrates the show with multiple Halloween-themed covers, including one of Jensen Ackles with a super-cute black kitten and behind-the-scenes photos sure to warm the heart and chill the blood. The shoot also included some interviews with Jared Padalecki (about Sam’s bonding with Jack) and Jensen Ackles (who talks about Dean’s “hopeless road” storyline in more detail), as well as video and spoilers (including the announced “return” of a Kevin Tran from alt-SPN and probable return of alt-Bobby, first seen in last season’s finale). There were also articles about the spin-off and the upcoming Scooby-Doo episode, which confirmed that the Christmas break will occur after 13.09 and that the Scooby-Doo episode will air in March. Jared Padalecki did an interview on Jimmy Kimmel Live. Mark Pellegrino is now being listed as a series regular and gave an interview about it to Variety. He confirmed that Mary will be around for a while. She and Lucifer will team up to get back to their universe. Lucifer also wants to keep Mary alive in order to trade her to her sons in exchange for Jack. Warner Bros has announced details about the upcoming Wayward Sisters spin-off. As we already know, it will star Kim Rhodes (Jody Mills) and the rumor that Briana Buckmaster (Donna Hanscum) is in it was confirmed. Also starring will be Kathryn Newton (Claire Novak) and Alex Jones (Katherine Ramdeen), as well as new character Patience Turner (played by Clark Backo). Another new character, Kaia (Yadira Guevar-Prip), has been added to the main cast list. Kaia’s “gift” will be the ability to spirit travel. The spin-off premise and new characters will be introduced via several episodes in season 13. Patience will be introduced in “Patience” (13.03), which also brings back season one character Missouri Moseley (who is Patience’s estranged grandmother and from whom Patience has inherited her psychic gift). The actual backdoor pilot will be “Wayward Sisters” (13.10). Season 12 is out on Amazon. The count for Supernatural calendars for 2018 is now four: a charity calendar called If I Could Tell You: The Women of Supernatural, taking orders now; two large calendars out on July 1 and two mini calendars on September 1. The show returned reasonably strong in ratings for the season premiere with a 0.7/3 and 2.10 million, which put it third after The Flash and a resurgent Riverdale.